Grab a cup of coffee or tea and read on to see what this New Moon Cycle has in store for you! This New Moon on the 5th of April is sure to relight your inner fire! Aries is the Inspirer of the Spirit de la Lune deck. This sign holds the energy of action, courage, swiftness and decisiveness. When the Moon is in Aries we feel more inspired towards action and beginning something new. Anytime we shift seasons we are experiencing the turning of the Wheel of the Year, and with that turning always comes opportunity for transformation, both inside and out. Here in the Northern Hemisphere we are experiencing Spring and the reawakening of the Earth. This New Moon in Aries begins the Flower Moon cycle and provides us with the rejuvenation we need so we can reach our goals so that we too can bloom. Spring is in the air. Blossoms are appearing & the flowers are eager to bloom. we are finally able to take action towards our goals! This week, along with that inspiring energy of the New Moon, we are also feeling the effects of Mercury Retrograde fade away. Obstacles and blockages are clearing up and we are finally feeling ready to take the action we need in order to accomplish our goals! Tend to the garden of your intentions. On April 10th, Jupiter will go retrograde in Sagittarius. Sagittarius is the home sign for Jupiter, the planet of abundance, wealth, and expansion. There is no reason to fear this retrograde! The card pulled for this cycle is Waxing Gibbous: Connect. Take some time to connect with your loved ones this week. It’s important for us to connect and reconnect with our tribe often. Not only to show them that we care, but to continue to build the connection. We connect with kindred souls so that we can learn lessons towards our own soul’s evolution and enlightenment. You can’t get the word relationship without relate! Your soul yearns for the connection of your tribe and loved ones. Gather them close around you and enjoy the rekindling of love, friendship, passion, and creativity, especially with the Sun and Moon are in Aries! The first quarter moon takes place in Cancer on the 12th of April. When the moon is in her home sign of Cancer, we too feel drawn towards matters of the home. You might feel a bit more sensitive during this time since Cancer can increase our emotions and make us feel vulnerable. You might feel pulled inward or withdrawn. If this is the case, stay home! Use this time for spring cleaning or organizing your space. You might not feel like interacting with others as much right now, but you can still utilize this time towards making room for new growth! This week, intentionally cleanse and bless your space, then take a nice bath and cleanse yourself to truly allow for the transformational energy that this new season is bringing us all. The card pulled for this week is Waxing Crescent: Expansion. What is growing in your life? What needs more expanding? Take some time to write out simple, actionable steps you can do within the next week that can help keep you on your path. When your goals are in front of you, and you know what steps to take, be sure you set aside time to prepare your home and self for the expansion ahead. In order to see new growth you must first make room for it! Use the energy from this first quarter moon in Cancer to help you make room for expansion. You’ve planted the seeds, now make room for them to bloom! The Full Flower Moon shines bright on the 19th of April in the sign of Libra and Scorpio depending on your location. The full moon takes place just before the Sun transitions in the earthy sign of Taurus. This Full Flower Moon has some dynamic energy to it! For some, we will experience the Full Moon in Libra, while others will experience the Full Moon in the watery sign of Scorpio. Libra and Aries are opposite of each other, which can bring about some uncomfortable moments. Especially because Mercury is now in Aries! Libra holds the desire for slower, calculated decisions, while Aries loves to act quickly and get things done! As tough as it might be, it is important to weigh out our decisions at this time! Some will experience the Full Moon mainly in the sign of Scorpio. Full moon energy can be felt 3 days before and after a lunar event… so technically we feel the full moon in a few different signs each time. This Full Moon’s energy is dynamic and intense either way. Again there is opposing energy here as Scorpio is a water sign and one of emotional and spiritual sensitivity. It’s okay to relax into your vulnerability at this time. The Full Moon holds opposing energies, but this doesn’t mean you are stuck! Opposites attract for a reason. Without the comparison and new perspective that discomfort can bring, we would never see any growth; let alone have any desire for improvement! Check in with your planners and deck this week! Pull the Flower Moon Spread for yourself and take time for yourself to color in your Moondala! Mandalas are such powerful ways for us to access our subconscious! You don’t have to draw one to feel the effects. Just looking at one can help us access our intuition and subconscious. The act of coloring in of itself is a wonderful and therapeutic meditation… but doing it in a circular fashion by following a mandala can be significant and healing! We’ve prepared 12 colorable mandalas in the planner with this intention! You can even color in a mandala with an intention in mind. This will help YOU focus your intent in a powerful way by tapping into your own innate subconscious “creative” abilities. Later you can use the mandala as a placemat for a crystal grid or even charge your deck! Pairing this simple ritual with the Full Moon energy can be not only emotionally fulfilling and relaxing, it can also be constructive towards your manifesting your goals on a subconscious level! Be sure to check back on the blog for the Full Flower Moon Ritual on the week of the Full Moon. Just days after the Full Moon, on the 20th of April, the Sun moves into the earthy sign of Taurus. Taurus holds hard working and determined energy. Aries plants the seeds of inspiration, but it is Taurus that does the daily work of making sure the seeds bloom. It takes a lot of willpower and dedication to achieve your dreams! While the sun is in Taurus, we get the extra push of determination we need so that we can take the daily steps. Often times, it’s the small daily steps we take that provide us with the biggest results. Let this Taurus energy help you build up that powerful momentum by putting in the daily efforts towards your goals… no matter how small they seem! The card pulled for this cycle is Waning Gibbous: Surrender. In order to move forward, there might be something you must sacrifice or surrender. Because of the Full Moon energy, it may be the energetic or emotional act of surrendering that is needed most. The act of surrender can be one of the hardest lessons to learn, but with great reward. There is a deep peace that comes with surrender... often times when we surrender, we actually win! If you feel like you are struggling to move forward, try to go with the flow. Release your expectations of how things must be and trust in the universe and the natural currents and cycles of life. The Last Quarter Moon takes place in the sign of Capricorn and Aquarius on the 26th of April. Capricorn is another earthly element that helps us see things objectively and remain disciplined. This is great when paired with the energy of the last quarter moon. It’s a good time to finish up the things we started during the New Moon. The last quarter moon will also take place in Aquarius for many. It might feel hard to get out of your head and stay in reality during this time! There is much to learn and discover in the realm of the imagination… but the last quarter moon brings attention to the need to release and finish up. Try to stay grounded during this time! Just days before the last quarter moon, Pluto goes retrograde in Capricorn. This means we need to learn to accept and adapt to changes on an inner level in order for us to find success in our outer world. On April 30th, Saturn goes retrograde in Capricorn as well. This will highlight an even greater need to stay disciplined! This retrograde will last for about 5-6 months, so it might be a good idea to look ahead and make some long term plans so you have something to stick to! It might be hard to make the changes we need to unless we have a strict plan to stick to. Capricorn loves rules, regulations and discipline, so be sure to set some deadlines for yourself when you set your new moon intentions! The card pulled for this cycle is Blessing Moon: Contentment. There is much to be grateful for right now! You can get a lot of momentum going in your direction simply by cultivating an attitude of gratitude through feelings of contentment and thankfulness. Don’t let the retrogrades make you nervous or worried. Take the proper time to plan ahead, but also allow yourself the time and space to revel in your accomplishments! The moon might be waning towards new again, but this is no reason to not take a step back and celebrate the steps you’ve taken. Taking the proper time to find gratitude and contentment in daily life helps create momentum for future growth. This New Flower Moon Cycle is sure to relight your inner fire and reignite your passions! We go from fiery passionate Aries energy to determined earthy Taurus to help us complete our goals. While we have several planets going retrograde, we can use this foresight to plan out the next 6 months! Capricorn does great with a plan and when a planet is retrograde in Capricorn you might find it hard to focus if you don’t have a solid plan and a deadline. Use this to your advantage when planning! This new moon in Aries is a great time to set solid intentions for both your short term and long term goals. This will come in handy later when the moon is waning back to new and many planets go retrograde in Capricorn. You will feel more self-disciplined, and thank yourself if you have a solid list to go from! Don’t forget to charge your decks and crystals tonight and check back here for the Full Moon Ritual! Our planners are currently on sale! It’s never too late to plan ahead! 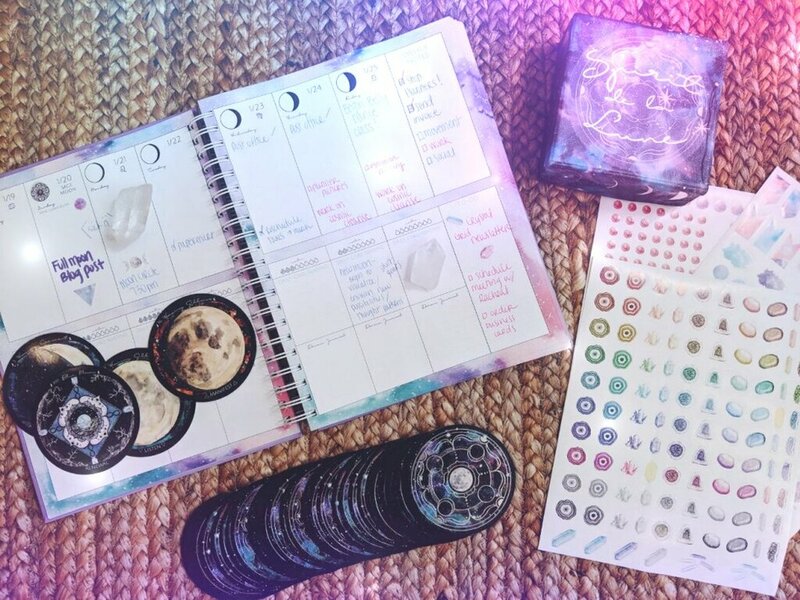 Our 2019 Spirit de la Lune Planners are ready to ship and ready to help you plan the year 2019 according to the moon and your intentions! Each planner comes with 3 sticker sheets and a large year at a glance poster! We are also now offering readings and other intuitive servies! Both Marissa and Rachael are seasoned tarot and oracle readers. Each of them bring different spreads and insights to your readings. Follow your intuition and choose the reader you are drawn to.